Ladakh is on the far side of the Himalaya mountains in a remote region of northern India on the western end of the Tibetan Plateau. The average altitude is about 12,000 ft but some villages and nomadic tribes live at 14 to 16,000 ft. Kardung Pass, just north of Leh, the capitol city, boasts the highest motorable road in the world at 18,380 feet. 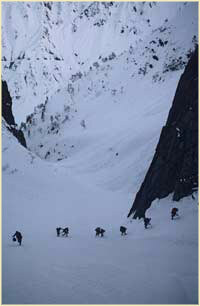 Peaks range from 24,000 to 28,000 feet throughout the region. 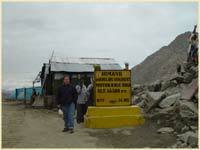 One of the lowest points in Ladakh is the town of Kargil at around 8,000 ft. 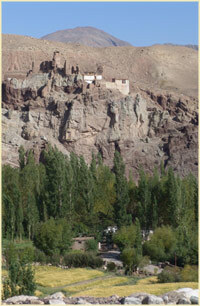 Many villages, accessible only by foot, are in extremely remote areas and have been somewhat isolated from the rest of Ladakh. The Thresher Project provides small gasoline/kerosene powered wheat and barley threshers that can be transported by foot (man carrying video, top of page) or animal (animal carrying video, top of page) to villages that have been bypassed by humanitarian assistance. 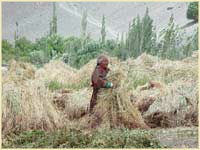 Wheat, barley, and potatoes are the main crops grown in Ladakh. 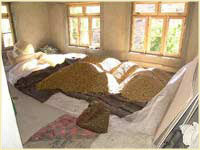 Hulless barley is roasted and ground to make tsampa; tsampa is a staple food in many of the more remote villages. Hulled barley is used to make chang, the local beer. 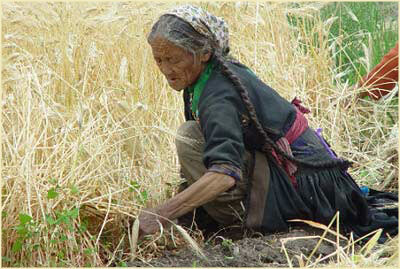 In most cases each family has enough land to plant wheat, barley and some vegetables that will last them for a year. Potatoes were introduced by Moravian missionaries in the early 1800's and have been a common crop for the last 150 years. Within the past 10 years or so vegetables such as cabbage, carrots, tomatoes, cauliflower and peas among many others have been introduced and thrive in the intense sunlight during the summer months. 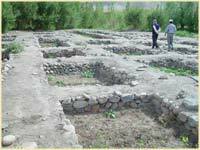 Pit-beds, which are essentially small below-ground green houses are common in many villages. 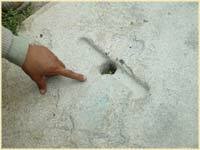 They are essentially holes, 2 to 3 meter square that are about 1 meter deep. The pit is covered with plastic and allows early planting of many cool-season vegetables. Professor Mir, now retired, formerly in charge of the Agriculture Program for the Agricultural University, provides a tour of pit-beds and other greenhouses. 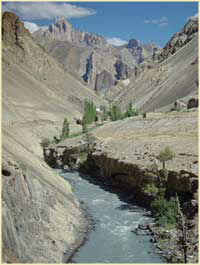 The difficulty of traveling to Ladakh has isolated it from the rest of the world for hundreds of years. With the advent of commercial air service into Leh, much of the western world, along with its technology, has found its way here. Solar power, cell phones, cyber café's and satellite television have changed Ladakh forever. 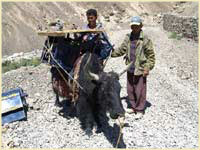 Side by side with the technology that much of the world considers indispensable, Ladakhis still plow with animals (most commonly using a Ladakhi Dzo which is a cross between a Yak and a cow) plant their crops by hand, and irrigate with glacial melt. When the crop is ready they harvest by hand, thresh with animals, winnow by hand, wash the crop in ice water and mill it with a water driven grinding mill. Wheat and barley have traditionally been threshed by driving 4 to 7 animals (donkeys, yak, cows and/or dzo's) in a circle over dried grain. One person drives the animals and one or two others add sheaves to the threshing floor as needed. One person monitors sheaves that fall outside the edge of the floor (animals threshing video, top of page). After the animals have trampled the grain for about 6 to 8 hours (about 90% of the grain has been threshed at this point), winnowing begins (winnowing video, top of page). This process can take several days depending on the strength and frequency of the wind. Once the grain has been winnowed it takes about a day to remove the last bit of chaff using a large strainer (sifting video, top of page). 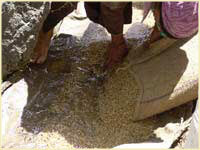 After straining, small rocks and the last bit of chaff is removed by washing in a process that is similar to gold-panning (washing wheat video, top of page). 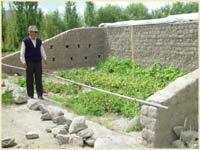 It generally takes from two to three weeks for a family to prepare their crop for the winter. 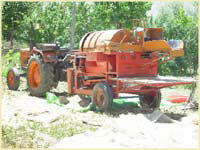 If a village is near a motorable road, a large mechanical thresher run with the power-takeoff from a tractor is available. 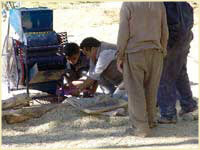 However, this machine tends to pulverize the chaff making it difficult to use for animal feed and bedding. In a farm-culture where chaff is worth 5 times by weight what the grain is worth, this large thresher is a last resort to many. Not all villagers have animals, so many pursue outside employment for cash to rent animals from their neighbors. Even villagers who have animals cannot always depend on them because they get sick and sometimes die. 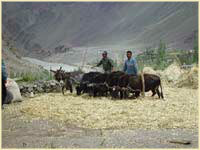 There is a shortage of labor in Ladakh so the time involved in animal threshing means that some farmers must hire outside labor. A portion of the grain is left un-threshed in the chaff and is ground into the dirt floor. Animals defecate and urinate on the grain while threshing. Although the unsanitary aspects of animal threshing may be debated because the grain is washed after winnowing. It is considered a sin in Buddhism to mistreat animals so there is a level of remorse for more spiritually conscientious farmers when they use animals to thresh. 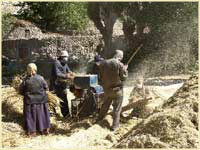 The threshed and cleaned grain is dried and then ground with a water-driven mill that once started, runs continuously. 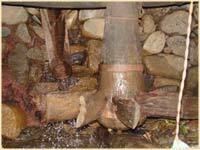 Water runs down a raceway (mill raceway video, top of page) to a below ground-level paddle wheel and turns the top stone at ground level. One or two grains at a time is fed into a hole in the rapidly rotating top stone (watermill video, top of page) and ground between it and the stationary bottom stone. The flour makes its way to the edge and falls into a trough encircling the stone. It takes many days to mill an entire crop which must be finished before water in the race-way freezes. 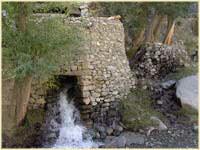 Because of the obvious need for water, grinding mills are built next to rivers. This makes them vulnerable to flooding, which has occurred with increasing frequency in the last several years. In 2006 the village of Skindyang lost all but 1 of its 10 water mills in a downpour that also washed out all the cement bridges that join the two parts of the town. 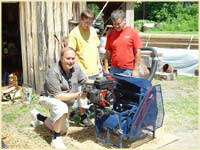 The "Ladakh Thresher" is a gasoline/kerosene powered unit, designed and built by Bill Peck, a student at Pennsylvania College of Technology. It is made in 3 pieces and can be disassembled in 10 to 20 minutes. It can be carried by animal or person (loading thresher video, top of page) to any village without a road and reassembled in 30 minutes. 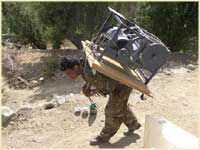 The engine will thresh for 6 to 8 hours with 1 gal of kerosene and produce very "high quality" chaff. 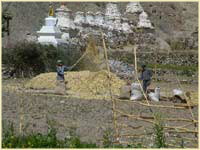 Since chaff in Ladakh is worth 5X by weight what the grain is worth, this is a crucial advantage of this machine. The savings in time is the major advantage of the thresher. A crop that would take 10 to 14 days to thresh and winnow using animals and the wind takes from two to three days using the kerosene-powered thresher. 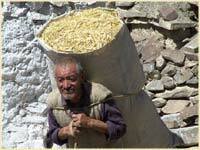 After harvest many Ladakhis travel to other parts of Ladakh and even to southern India for manual labor and the time they save using the thresher enables them to leave earlier. All issues associated with animal-threshing (sanitation, illness/death, animal rental) are eliminated. The head Lama of one village told us that he likes the machine because it runs on its own and they do not have to beat their animals to get them to cooperate in the threshing process. Ladakh faces an uncertain future with regard to climate change. Whether the rains of August 2006 will recur is not known. While the debate on climate change continues, it seems clear that certain technologies could be crucial to allow Ladakhis to survive the effects of weather that they have never experienced. In addition to weather changes, land use is at a crucial stage with virtually no opportunity to expand the amount of tillable land. Providing expertise to help maximize crop yields will be the only option to allow Ladakh to keep up with its expanding population. The Indian Department of Agriculture has provided agricultural expertise by dividing Ladakh into 5 areas and assigning an extension agent to oversee various aspects of agriculture in their respective regions. Much of the new vegetable introductions as well as the pit-beds and greenhouses are a result of the Department of Agriculture and its extension program. In addition, plant breeding efforts at the University of Agricultural Sciences and Technology of Kashmir have resulted in the release of several high yielding wheat cultivars and the introduction of numerous fruits and vegetables. Ladakh Development Foundation was organized in October, 2006 to help provide technology, agricultural expertise, and medical assistance to regions of Ladakh where limited resources prevent current development agencies from operating. Thank you for your interest in this project. You can assist the Ladakh Development Foundation to help the Ladakhi people by sponsoring the manufacture of threshers and mills.